The recent flare-up of the Indonesian forest fire problem and the deterioration in our air quality is understandably also causing temperatures to rise in Singapore. Our neighbor Malaysia is also equally if not more severely affected. This happens year after year causing severe respiratory problems for those afflicted with asthma, forcing schools to cancel outdoor activities and keeping people inside. Yet what is notable is that our government seems unable to come up with any solutions despite the fact that this has been going on since 1997. In particular they do not seem capable of applying some simple lessons from economics. Economics teaches us that pollution is an example of a negative externality. A negative externality occurs when a third party has to bear the costs or negative impact of the production of another party. An example within Singapore would be congestion on the roads. As the roads become congested due to the increasing number of private cars, public transport users and non-car owners have to bear the negative costs in terms of longer and slower journeys, pollution, noise and congestion. A positive externality is when the third party benefits from the action or production of others. Those who choose to forgo the comfort of a car are benefiting others. Growing plants for our own pleasure or use on our balconies ( so long as we guard against mosquitoes) actually benefits the whole environment not just us. A government that invests in education produces a host of positive externalities. In the case of the haze from Indonesia the negative costs are primarily the additional health expenditures required to treat the problem as well as any economic losses arising from people having to take days off work. There is also the damage to the tourist industry, both short and long term. There is also the possible long term damage to health resulting from the pollution. This damage is all capable of being quantified yet it does not seem to have occurred to the government to do so. I would confidently estimate that the costs run into billions of dollars. Now Iam going to bring in some theory. A government familiar with the Coase theorem (named after Ronald Coase who won the Nobel Prize in Economics in 1991) could have gained some insights here. Problems with externalities can be viewed as problems of the distribution of property rights. The right to pollute can be viewed as a property right as can the right to clean air. Now, in an efficient market without transaction costs this property right should go to the highest bidder, i.e. the party to whom that right is worth most. Is there any way to stop this menace? 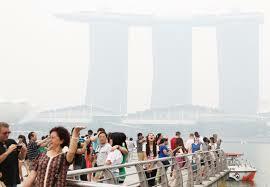 Well, the economic loss if not the misery could be solved by the Indonesian companies involved paying Singaporeans for the additional health and other costs that we incur as a result of the pollution. However Indonesia as a sovereign state feels no necessity to compensate Singaporeans and Malaysians for the costs incurred. Disappointingly ASEAN has set up no legal mechanism for dispute resolution of this kind and the awarding of compensation for damage suffered from externalities that cross national borders. It shouldn’t surprise us that the PAP government appears unable or unwilling year in year out, to do anything beyond telling their Indonesian counterparts that the situation is serious. It shows how ineffectual ASEAN is. So penalizing Indonesia or fining them clearly isn’t workable given the current framework. I have a much better idea based on The Coase theorem. Rather than seeking damages for the costs of the pollution we should just pay Indonesia for our clean air. Singapore could pay the Indonesian farmers and plantation owners responsible for the haze to use other methods to clear their land. We are a wealthy Nation and because we lose billions of dollars to this haze every year, this right (the right to clean air) is worth a lot of money to us. Lacking an international legal framework to award and enforce compensation claims, Singapore and Malaysia should offer the Indonesian government a sum sufficient to compensate the farmers and plantation companies for the additional costs incurred by switching to another method but obviously less than the value to us of having clean air. The problem is that the prospect of financial payments is likely at the margin to induce new companies to enter the “industry” of slash-and-burn clearance just to receive compensation. For example if I pay my neighbours on the left to stop growing flowers in their garden because I have hay fever then the neighbours on the right would immediately start planting flowers to get me to pay them to stop. Therefore it would be better if the compensation took the form of a lump sum payment to the Indonesian government to be given to those responsible coupled with a continuing payment towards the costs of rigorous enforcement of a total ban on such methods. This cannot be too difficult given rapid developments in drone technology to allow intensive monitoring of large areas. Singapore could also contribute towards the development of low cost but less environmentally harmful methods of land clearance. Objections have been raised, particularly by Indonesia, that a large part of the pollution is produced by plantation companies listed in Malaysia and Singapore. We are able to raise a levy on these companies sited on our homeland. Perhaps part of the costs of compensating Indonesia can even be defrayed by levies on these companies. They are unlikely to be able or willing to escape the levy by relocating elsewhere. So, I offer a simple solution. I am sure there are many other suggestions. The real question is why our government has done nothing about it for the last fifteen years. As always I am convinced that they have no long term plan or model capable or reacting to evolving situations. I have many times said that their plan is a super tanker set on course. They can calibrate it slightly on route from A to B but super tankers are notoriously difficult when it comes to turning a circle or changing direction. The one child policy is a perfect example of a PAP super tanker route. Population rates are particularly difficult to change and once affected almost impossible to put into reverse. Another example is the PAP economic model of growth essentially based on low cost labour which is now increasingly obsolete in the face of disruptive technologies like advanced robotics, 3D printing and automation of knowledge work. The PAP ministers cocooned in their million dollar salaries are largely indifferent to our health and well being or are simply incapable of coming up with positive policies. Let us return to those negative externalities. I often berate Singaporeans for being prepared to put up with conditions of austerity that citizens of advanced democracies and economies would never tolerate. Maybe it would be more obvious if we were to look at what I call austerity as a negative externality. Let’s turn this on its head. If the PAP was a farmer burning and causing haze the negative externality it produced would be obvious to you. It is not a factory of course but citizens as the innocent third party are forced to bear the negative costs of the PAP policy of unnecessary savings. Savings far beyond any level that would be considered necessary for a reserve fund, as a buffer against a rainy day. The negative externally is borne by you as over a 50 year period the PAP wilfully under spends and under invests in its citizens’ education and health. This causes me to ask once again, who do our huge reserves (even taking into account the discrepancies I have highlighted before) actually benefit? And do our people vote for the PAP believing that bearing the negative externalities is a good way of existing or have they simply had the wool pulled over their eyes? Finally I will compare Temasek Holdings with Norway’s sovereign wealth fund. As you know I often bring up Norway’s SWF as a model of good governance and a model of transparency. Bearing in mind that Norwegians of course enjoy a full welfare state although this is not something I would advocate for Singapore. A couple of years ago Norway’s SWF made a major policy shift. They decided to invest a significant part of their funds into environmentally responsible companies. Norway’s Ambassador speaking at the time said the investment strategy was “just the start” of her country’s use of state – backed financial mechanisms to halt environmental degradations. Meanwhile Temasek is using state finance to invest in plantation companies. In 2005 it acquired CDC group’s plantation interests in Indonesia including Sumatra in partnership with Cargill. So ironically if we do pay for our clean air we could be paying our own government for the right to clean air. Negative behaviour should not be rewarded. By paying Indonesian money, which is already corruption filled, it will not improve the situation. It will only reinforce negative behaviour (forest burning) as they will be given money for not doing it. Why be held ransom by those who act irresponsibility ? Besides if they are rich companies, it is ridiculous to hand money to them. @ Georgia, Surely my argument is to reward positive behaviour. In that case you are agreeing with me. My suggestion is to reward or incentivise them to use different methods of land clearing. I posted this comment in TRE on the subject of the haze. “There is a simple way to stop the burning of forests in Sumatra. The SG government should bribe the regional governors US$10m each for them to apply existing laws. It’s a cynical suggestion but it might work as the goverment of Indonesia is decentralised and the provincial governors have a lot of authority. Why not show our military might.